American women have been known for their leadership throughout the history of the United States. Not always called leadership, their management activities have earned them the reputation of being strong, resilient women capable of great initiative. This translates into the current notion of a woman educational leader as evidenced in a recent study. 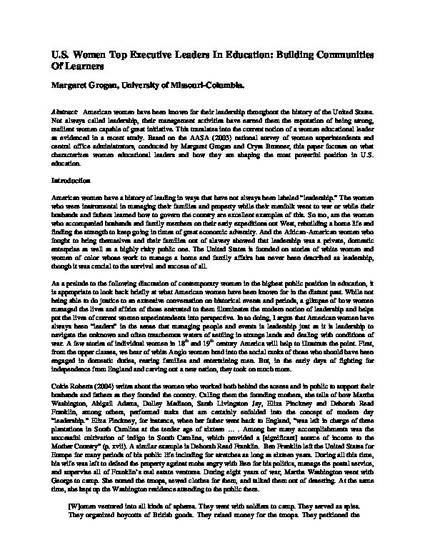 Based on the AASA (2003) national survey of women superintendents and central office administrators, conducted by Margaret Grogan and Cryss Brunner, this paper focuses on what characterizes women educational leaders and how they are shaping the most powerful position in U.S. education. Previously linked to as: http://ccdl.libraries.claremont.edu/u?/irw,316. Originally from an MS Word document. Grogan, M. (February, 2005). US women top executive leaders in education: Building communities of learners. Proceedings of The 2004 Hong Kong/Shanghai Commonwealth Council for Educational Administration and Management International Conference.